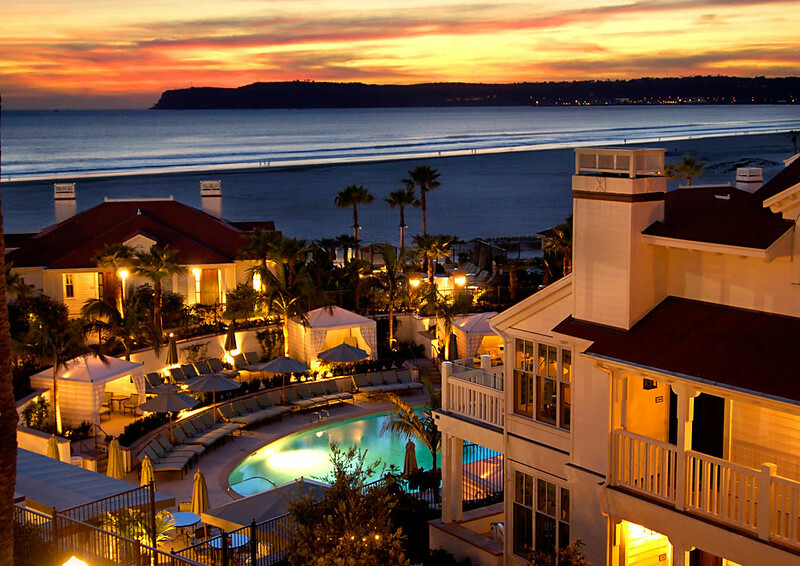 Steps from the Pacific Ocean, the Beach Village at The Del offers an exclusive setting at the Hotel del Coronado. Ideal for travelers seeking additional privacy, the Beachfront Suite offers a front row location within the Beach Village, as well as 830 square feet of space. The resort's 78 guest rooms configure into one to three bedroom suites, with ocean view terraces, prime beach access, and fireplaces. Within the Beachfront Suite, there's a gourmet kitchen with a Sub-Zero refrigerator, stainless steel gourmet Wolf cooktop, built-in oven, and dining room with seating for four. Read more below the photo. The Greatroom living area has a pull-out sofa bed and fireplace, plus a 42-inch TV, Bose surround sound system, and DVD player. There's central air conditioning and ceiling fans for additional climate control, as well as patios or balconies within every guestroom. Bedrooms have 400-thread-count bed sheets, plush beds, and turndown service. While bathrooms have custom vanities with soaking tubs, separate showers, plush bathrobes and bath sheets, as well as stone tile flooring. Read more below the photo of the Windsor Cottage. Guests of the Beach Village experience personalized service as well as exclusive amenities beyond those at the iconic Hotel del Coronado. The grounds of the Beach Village are gated, there's exclusive swimming pools and whirlpools, a VIP restaurant, and access to the Windsor Beach Club with a full-service beach area open Memorial Day to Labor Day. The resort's 78 guest rooms configure into one to three bedroom suites, with ocean view terraces, prime beach access, and fireplaces. In addition, there's a separate valet entrance, personal concierge, entertainment library, and party planning services for milestone celebrations. On Thanksgiving Day in 1892, a young woman checked in at the Hotel del Coronado, but never checked out. Estranged from her husband, 24-year-old Kate Morgan is said to have taken her own life five days after checking in (although some say her husband or lover may have pulled the trigger). Since her untimely death, guests and employees have shared stories of ghostly-encounters, mostly involving Kate's original third-floor guestroom. There have been stories of breezes coming from nowhere, inexplicable sounds, doors randomly opening and closing, as well as a TV that turns itself on and off. Independent paranormal researchers have documented supernatural activity in Kate's room, as well as Kate sightings in the hotel hallways, seashore, and the gift shop where items have mysteriously flown off the shelves. To date, her room, now 3327 is one of the hotel's most requested rooms. Continue reading below the photo of one of the Hotel del Coronado's a Victorian Junior Suite at the Hotel del Coronado. In addition to ghost stories, the Hotel del Coronado offers guests a variety of Halloween-themed activities including a Ghost Roast with ghost stories and s'mores on the beach, a Kate Morgan Painting by the Sea where guests can paint a piece of art to take home, a Kids Halloween Party, and the adults-only Hallo-wine & Spirits with a reception on the Garden Patio followed by deserts, drinks, and dancing in the Crown Room. Read more below the photo of the Crown Room. Since opening in 1888, the Hotel del Coronado has been a popular destination for presidents, celebrities, and politicians. In 1958, Marilyn Monroe, Tony Curtis, and Jack Lemmon filmed "Some Like It Hot" within the hotel. Under the hotel's signature red turret lies the Ballroom with Pacific Ocean views, the Crown Room has a renowned brunch, and the Spa at the Del provides an array of signature treatments. Learn about a special Perk for Five Star Alliance guests below the photo. Five Star Alliance Perk: Guests booking under the "5 Star Signature Package" rate will also include daily buffet breakfast for two, VIP services, and a $100 spa treatment credit per stay. Soaring 30 stories over the city, Hilton San Diego Bayfront offers a modern downtown retreat with a sun and sea-inspired design. Adjacent to the San Diego Convention Center, the luxury hotel is across the street from Petco Park, home of the San Diego Padres. Providing a convenient location in the heart of the city, the hotel is located on 4.3 acres of land with bay and skyline views. Within walking distance of the Gaslamp Quarter's dining and entertainment venues, the property has six on-site dining venues ranging from casual eateries to fine dining. Continue reading below the photo of the Pool Club Lounge. Providing a convenient setting for business travelers, the property has meeting rooms, Notary Public, office rentals, and The UPS Store. In addition, the property has an array of amenities focused on leisure travel needs including children's activities, cribs, and family packages. While there's a variety of fitness and recreation options such as an outdoor pool with bay views, fitness room, and a walking and jogging track. Plus, the hotel has the full-service Eforea Spa with a focus on providing services and treatments focused on wellness and balance. Read more below the pool photo. Overlooking San Diego Bay and downtown, the hotel's guestrooms feature coastal chic furnishings, Serenity beds, 55-inch flat-screen TVs, and work spaces. While suites have both bay and city views, separate bedrooms, and living rooms with 65-inch flat-panel TVs. When it's time to escape the holiday madness, Hotel del Coronado's seaside spa sanctuary awaits. Gather your friends to relax and unwind at Spa at The Del's exclusive After Hours party and tap into ocean tranquility. Whether you desire an organic facial, hydrating body wrap, scintillating scrub, hydrotherapy soak, or muscle-melting massage, our cozy spa has the perfect pampering remedy for you. Designed for groups of 5-15, experiences can be customized based on guest preferences and may include customized culinary experiences, salon and spa treatments, mini-makeovers and more. Call 619-522-8824 to plan your party! 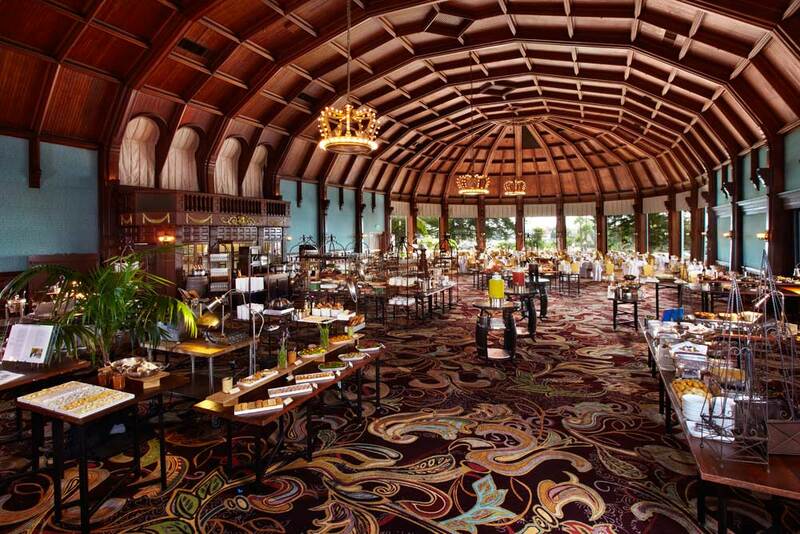 *The information in the article above was provided by the Hotel del Coronado. Offers, rates, and packages are subject to change. Celebrate the holidays as America's beachfront legend becomes a playful wonderland with pops of bright colors at every turn against a backdrop of twinkling white lights. With the return of Skating by the Sea, Hotel del Coronado is truly a sight to behold with carolers singing joyful tunes, whimsical polar bears striking a pose, lavish feasts and festive parties. Continue reading below the photo of Skating by the Sea. Gather your friends and family for holiday favorites like housemade gingerbread and cookies, mulled cider and spiked coffee drinks or roast s'mores on the beach under the stars. Step back in time with an elegant Victorian Tea or explore the magnificent holiday lights around Coronado on a decked out surrey. Read more below the photo Victorian Tea photo. Whimsical trees are trimmed and glisten with pretty packages underneath. Saint Nick appears at Sunday Brunch and friendly elves read holiday tales to children. The holiday season at our seaside retreat is filled with both nostalgia and new traditions. Read more below the photo. It's a time for magical adventures and creating memories with the ones you love, surrounded by the warm glow of The Del. Celebrate a winter of whimsy, wonder and wishes. Only at The Del. *The content of this sponsored article was provided by Hotel del Coronado. Offers and packages are subject to change. An iconic destination since 1888, the Hotel del Coronado has welcomed celebrities, dignitaries, and royalty from around the world. For a luxurious setting within the hotel's original Victorian Building, the Victorian Junior Suites have a spacious sitting area along with one king or two queen-sized beds, or the larger Ocean View Victorian Signature Suites offer a king-sized bed, plus a separate living room with a queen-sized pull-out sofa bed. 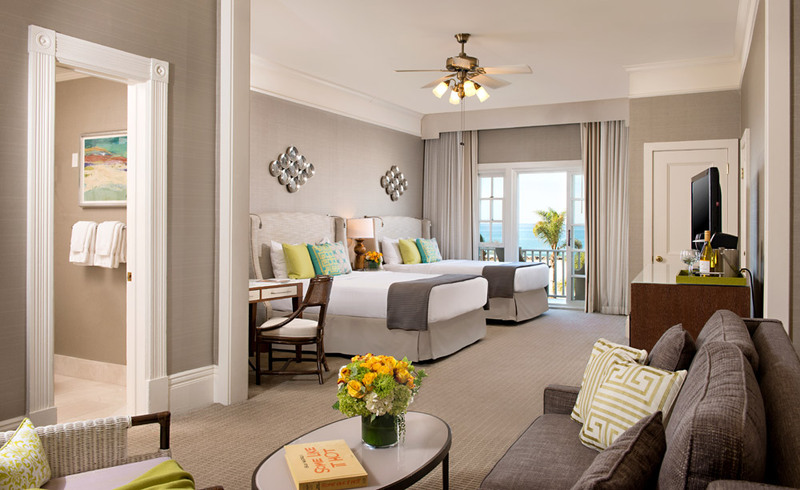 Due to the historical nature of the property, each of the Signature Suites varies in size and layout, which also lends a unique charm to the coastal chic furnishings of the suites. To top it off, the suites feature private balconies with panoramic views of the hotel's beach and the Pacific Ocean. Read more below the photo of the Victorian Junior Suite. For families looking for additional space, the hotel's Two-Bedroom Victorian Blue Octopus Family Suite offers spacious accommodations, including a separate bedroom for the kids with ocean-inspired whimsical decor and bunk beds. Plus, there are two bathrooms and a living room with a sofa bed. 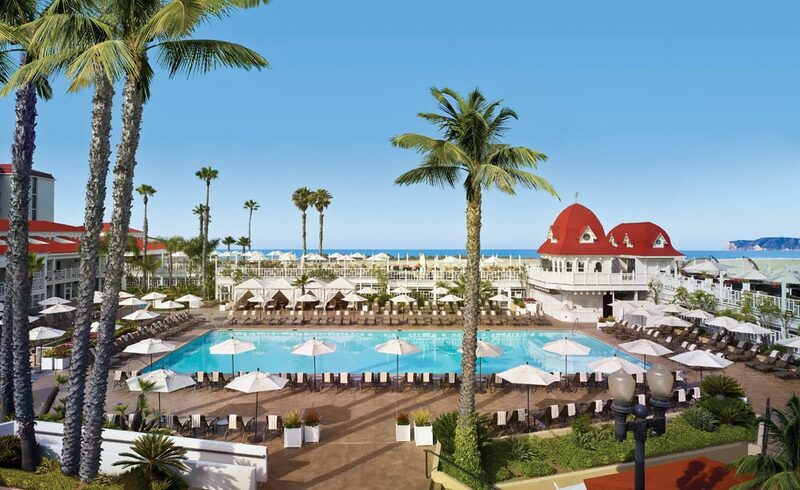 Read more below the photo of the Hotel del Coronado swimming pool. The Hotel del Coronado is a National Historic Landmark with the Victorian Building, contemporary Ocean Towers, California Cabanas, and oceanfront cottages and villas within the Beach Village. The iconic property combines Southern California seaside charm with fine dining at 1500 Ocean, a legendary Crown Room Brunch, spa, and the Sunset Bar with a firepit, seaside location, and seasonal cocktails. Continue reading below the Crown Room photo for a special Perk for Five Star Alliance guests. Five Star Alliance Perk: Guests booking through Five Star Alliance receive a commemorative book celebrating the history of the Hotel del Coronado. Situated in the heart of downtown San Diego, The Westgate Hotel recently opened the AquaView Spa & Wellness Center. The new facility is accessible to hotel guests and members. Learn more about this addition in the article below the photo from our sister publication, Luxury Travel Advisor. A new spa and fitness center is coming to downtown San Diego that is not just open to hotel guests, it’s open for memberships as well. AquaVie Spa & Wellness Center is open now to guests of the Westgate Hotel and patrons who wish to become members. The contemporary full-service Spa at AquaVie will open within the center in February 2017. The $14 million, four level, 40,000 square foot facility is located at 239 Broadway Avenue, adjacent to the Westgate Hotel. The new facility features more than 200 units of the latest fitness equipment, exclusive amenities and services to its members and hotel guests. Designed by Hollander Design Group, AquaVie was designed to reflect an urban amenity for health and serenity. Signature details include a silver travertine and glass stairway, custom and contemporary furnishings and cabinetry and a three-story water wall serving as the center of each level of AquaVie. The first level of the facility hosts a reception area where a wellness concierge greets and welcomes members and guests. On both sides of the main level two modern, expansive studios feature strength training provided by IRONGRIP and Technogym. The second floor is home to a spacious, full-service locker room and refreshing area. A ladies locker room includes a steam room, large dry sauna, glass enclosed showers, hydrotherapy circuits for pain relief and treatments, along with a number of vanity stations. The men’s locker room features a hot tub, steam room and sauna. Each space includes individual upscale lockers and inset TVS with full length mirrors for when you need a break from pumping iron. On the third level, guests will find stations dedicated to physical fitness training with a wide array of cardio equipment, including the Excite line by Technogym and Precor’s Experience Series 880. For strength training, there’s Technogym’s Element. Two extensive group exercise studios are also within the third floor to host daily fitness and wellness classes. Bonus: personal and group training equipment will be provided by both Technogym and IRONGRIP. The fourth floor is a 15,000 square foot rooftop, featuring a Junior Olympic-sized lap pool, a hot tub and a lounge area. The outdoor setting is well-suited for members who want to work out, unwind and just relax in the San Diego sunshine. The rooftop houses three private studios and wellness equipment, along with a 1/10th mile running track. A living wall serves as the rooftops centerpiece, connecting guests and members with serenity and the natural environment. If you’re not into working out, The Spa at AquaVie will offer five treatment rooms beginning February 2017. Services of the spa will include body therapy, massages, skin care, waxing and nail care options provided by trained experts. A lounge area will feature organic tea and spa water, and all skin care, body care and wellness products will also be available to purchase. An exclusive haven for life’s perfect moments. For those seeking a more intimate private experience, Beach Village at The Del is an exclusive enclave of cottages and villas, a resort within the resort, and portal to Southern California oceanfront luxury living. 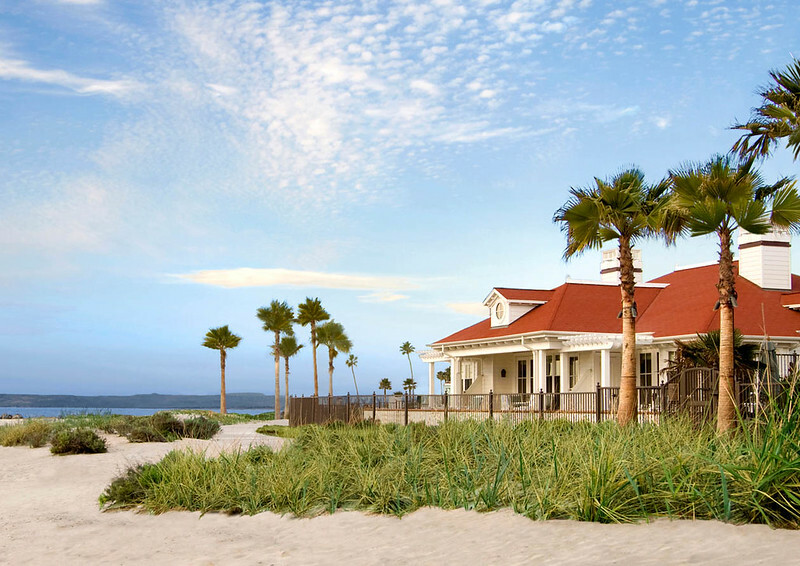 While the architecture nods to the iconic beauty of Hotel del Coronado, the 78 breezy-and-bright cottages and villas echo the beach setting and greet the modern with lavish amenities and high design. Continue reading below the photo. A recent refresh of all guestrooms brings the warmth, hue, and magic of the outdoors inside. Neutral tones like cream, beige and sand are accented with bursts of teal to reflect the sand and sea. Swirling patterns, paisley and geometrics pay homage to the movement of light and motion of the water. Circles of abalone shells trim the window shades, sparkling and mimicking the sunlight dancing across the sea. In addition to plush beds, divine linens, the finest appliances, sunken tubs, ocean view terraces, and more, some suites feature outdoor fire pits or soaking tubs for dipping. And every villa and cottage has a full or partial ocean view of one of the most beautiful beaches in America. Continue reading below the photo. “Dream it up and we will make it happen.” That’s the Beach Village mantra. Beach Village has welcomed dignitaries, celebrities, multi-generational families, distinguished guests and more; and the staff knows a thing or two about creating memorable moments and heart-stirring adventures—everything from a multi-generational, clambake and lobster feast on the beach or sunset sailing trip on a sleek yacht, to a private wine tasting with a top sommelier or romantic moonlit dinner for two prepared by a private chef. The Beach Village Host Concierges are committed to exceeding the expectations of every esteemed guest. Once a reservation is made, a host contacts the party (weeks ahead of their arrival) to create a custom itinerary for the guests, and fulfill any requests like stocking the villa with personal amenities and luxuries, or adding any special touches to the guestrooms or suites. The private main pool at Beach Village is dotted with six luxurious cabanas, colorful shaded oases with lounge furniture, flat screens, refrigerators, and full service. The team from Breezes restaurant will happily deliver gourmet poolside bites like surf-n-turf nachos with carne asada and shrimp; smoked chicken and pesto flatbreads with goat cheese and arugula; or local seabass fish tacos with smoked tomato salsa and guacamole. The bartenders are schooled in the art of the cocktail and whip up tasty refreshers like watermelon pisco sours, muddled mint mojitos or coconut coolers. Continue reading below. Once the Coronado home of socialite Wallis Spencer Simpson, the woman for whom King Edward of England abdicated his throne, Windsor Cottage is now a part of The Del legacy. Saved from demolition and placed next to the Windsor Lawn in 2000, the charming 1905 California bungalow serves as a private oceanfront retreat for Beach Village guests exclusively and a nod to the main hotel. Beach Village guests can enjoy complimentary daily breakfast, gourmet fireside dining or classic cocktails during a fiery Coronado sunset on the sprawling deck. Or when it’s time to relax, grab and book and tuck inside this cozy cottage where the Duchess of Windsor (and frequent Del guest) once lived.